Summary: If you are looking for an example of work that integrates mathematics and writing, this one is creative and supported through research related to math. 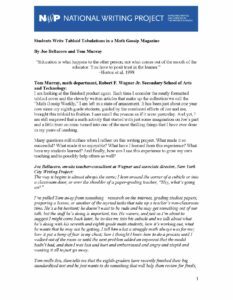 This is a teacher and teacher-consultant’s account of a “writing and math” strategy used in the middle school classroom. Students are asked to connect writing, math, and real-world problems. You may find “nuggets” that appeal to you as a teacher and/or facilitator. To begin the project, Joe and I had the students look at some supermarket tabloids in small groups. This allowed each student to explore the pictures, articles, puzzles, advertisements, horoscopes, and other aspects of these gossip mags. I loved just walking around the room witnessing them reading, discussing, and playing word games. The enthusiasm was palpable. This was what I had dreamed of—math or no math, that day there was life in my classroom. And yet I seem to remember fighting the urge to rush through this play and discovery time to get to some real math. Luckily, Joe was with me, and I now had the experience and training to know that this would not be the prudent thing to do. Instead, we had the students share one thing that they had read or had discussed with their group. And this helped us to identify the themes and contexts that make up a tabloid. The next day we gave every eighth-grader some guided free-writing time. Let me reiterate here that I was in the same uncharted waters as my students. What did anyone in the room know about writing tabloid articles? I simply had to trust Joe and the process. I was just hopeful that my students would do the same. And here was the first test of that trust. To my astonishment, after some whimpers and meager protests, each and every kid produced an initial piece of writing that had something to do with a math topic that they were familiar with and was in the context of a tabloid theme. Of course, the amount and quality of the writing varied tremendously. However, everyone was involved. We were taking risks together.